After donating over 27,000 pounds of food, 452 hours of volunteer time and $4,770 worth of gift cards during the 2013 holiday season, Seminole Hard Rock Hotel & Casino was the recipient of Metropolitan Ministries’ Golden Barrel Award at the latter’s Volunteer Appreciation Brunch last Saturday. Each year, Metropolitan Ministries, which cares for the homeless and those at risk of becoming homeless, hands out the Golden Barrel Award to a business partner which best exemplifies dedication and outstanding service to others. Additionally, during Seminole Hard Rock Hotel & Casino Tampa’s recent 10th anniversary celebration, the property committed $10,000 each for the next 10 years to Metropolitan Ministries. 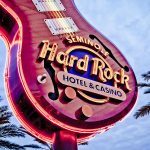 “Seminole Hard Rock Hotel & Casino Tampa is one of our top donors at the Clear Channel drive every holiday season,” said Mandelyn Cloninger, Director of Advancement at Metropolitan Ministries. “Last year, they rolled up with two big trucks and we have to thank them for the more than 27,000 pounds of donated food and for all of the hard work their employees put in to unload the food.